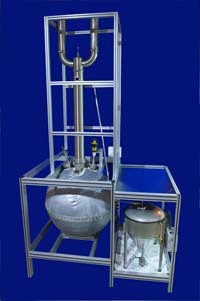 B/R International offers a variety of fractional distillation equipment with boiling flask sizes of 10 ml to 1000 liters. Materials of construction can be glass, stainless steel and other materials upon request. 50-1000 liter fractional distillation This 9700 combines the efficiency of glass fractional distillation equipment with the ruggedness of stainless steel. Boiler sizes of 50-1000 liters. 1-50 liter fractional distillation The 9600 is a high efficiency distillation apparatus that can handle boiler sizes of 1 to 50 liters. Distillation columns are appropriately sized. 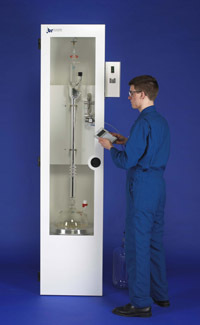 50-1000ml frational distillation The 36-100 mini-distillation system is the ideal fractional distillation equipment for boiler sizes of 50 to 1000 ml. The 200 theoretical plate distillation column can produce high purity fractions and make difficult separations. 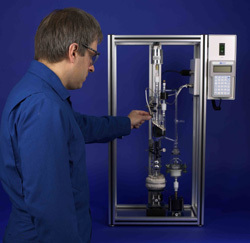 50-100ml fractional distillation The 800 micro-distillation apparatus can handle boiler sizes of 10 to 100 ml. 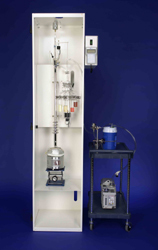 The 30 theoretical plate column can make produce high purity fractions on these very small charges. The low column hold up leaves on a fraction of a milliliter behind in the column when the distillation is complete.